Grand Theft Auto IV on Games for Windows LIVE is now available through the Games on Demand service. This means any of you who have not yet got your filthy hands on a copy of the game, can now download it directly from the Games for Windows LIVE client for just �19.99 (or .99). The PC version of GTA IV has some exclusive features including an easy-to-use video editor tool, hugely improved graphics, the Independence FM radio station that allows you to add your own songs in game. Plus insane up-to-32-player multiplayer matches. And remember, Episodes from Liberty City comes out on 30th March for the PC and PS3, so now would be the perfect time to get GTA IV. Rockstar have announced a whole host of dates for Episodes from Liberty City events, mainly on PlayStation 3 and PC. Further details and specifics for each event will be posted nearer the time. Yes, our first official PC event in this series � complete with live stream, chat and all. Let�s get that full-on up-to-32-player mayhem going. A final Grand Theft Auto IV PS3 Multiplayer scrimmage with Rockstar before Episodes from Liberty City invades your world less than three weeks later. Last licks for a little while for the XBL set � we�ll be spending April giving PS3 and PC gamers their due of The Ballad of Gay Tony and The Lost and Damned multiplayer love. Look for some special giveaways to be announced. Back to back first weekend of Episodes multiplayer events for both PS3 and PC. Let�s get it on. Planning for some of our ringers at our dev studios at North and Toronto jumping in to really show you what�s up. Make sure to take advantage of those first few days after game release to get on point. Up to 32-players... BASE Jumping... Free Mode... Explosive Shotgun Deathmatches... let your imagination run wild. Plus we�ll be giving away some deluxe PC gear to be announced. You will be prompted to download and install the update when signing into LIVE. 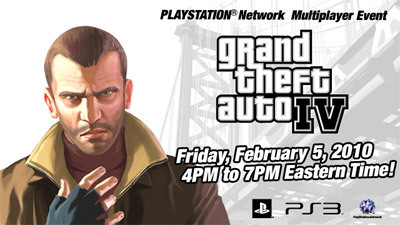 Following on from the success of the Xbox 360 multiplayer events, Rockstar will be hosting another multiplayer event on Friday, 5th February (tomorrow) from the usual 4PM to 7PM Eastern Time, this time on the PS3. A PC event will be coming up soon, and there will be a whole calendar of events announced next week! So stay tuned for those.